The 5000 Series is a four-door, commuter-type electric multiple unit developed by the Teito Rapid Transit Authority (currently Tokyo Metro) to operate on the Tozai Line. With the construction of the new Tozai Line underway during the early 1960s, the TRTA started working on a new train to serve this line. The design was based on the JNR's 103 Series, but it was closer to the TRTA's 3000 Series in performance. 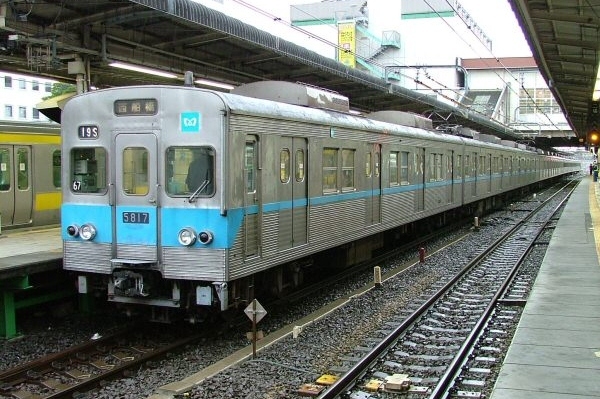 Like the 3000 Series on the Hibiya Line, the 5000 Series was built with a regular steel frame and covered with a stainless steel outer shell. However, the design was simplified to cut costs. Resistance control coupled with DC motors was used, but the control system used a series of smaller resistors wired to the regular resistors to help increase traction and ride quality. 407 of the 428 cars produced were stainless steel with corrugated side panels, but the other 21 were constructed of aluminum alloy and had flat side panels. All stainless steel formations have been removed from service with most of them being scrapped. Three formations though, have been donated to Indonesia. Two aluminum-bodied formations continue to operate on the branch line of the Chiyoda Line which connects Ayase station with Kita-ayase stations. These formations have been shortened to three cars. Three formations have been exported to Indonesia where they are operated by PT Kereta Api on the KRL Jabotabek mass transit system.